From May 30th, researchers from the Indiana University of Bloomington will begin to work on Greek and Roman marbles of Uffizi, Palazzo Pitti and Boboli Gardens. The work will occupy the researchers for about five years: at the end of the project 1260 statues will be cloned. The digitized works will become part of a virtual museum, a large database available from 2020, that will be available for study and protection purposes. The work will begin with the scanning of the marbles, that will be studied in detail, looking for lost colors, and other secrets of the great artists of antiquity. 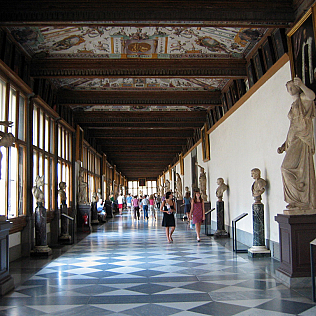 Many famous works will end up under the rays of the researchers, as the Medici Venus - housed in the Uffizi Tribuna - or the Dying Alessandro, but also the Sleeping Arianna and the Niobe room group. The works will be - in the virtual version - admirable by all. Moreover, with the use of certain technological tools, it is envisaged that it can also be experienced the tactile sensation. The operation will cost about 600 thousand dollars: the figure will be covered by the University of Indiana. The project will be coordinated by Bernard Frischer, a professor at Indiana University and of virtual archeology, and Fabrizio Paolucci curator of classical antiquities of the Uffizi Gallery. The Politecnico di Milano and University of Florence will also partecipate at the project.